Although your bathroom may not be as large as you would like, there’s no reason why you can’t make the most out of what you have. In fact, by incorporating some clever storage ideas, you can store just about anything you want while avoiding unseemly clutter. When it comes to storage ideas for small bathrooms, you’ll soon find that it’s not the size of the bathroom but the extent of your resourcefulness that matters most. Read on for some tips on how you can best maximize the storage potential of your small bathroom. Using small racks, such as spice racks, can provide you with a useful, attractive way of storing toiletries and other items in your small bathroom. Don’t worry if the color of the racks doesn’t necessarily fit the color scheme. A little bit of paint will do the trick. Bookshelves are useful for much more than book storage. Consider installing a small, lightweight bookshelf above the bathroom door to provide you with extra space for towels, washcloths, and other items. While you’re at it, consider rolling, as opposed to folding your towels. You’ll be surprised at how much extra space you can open up for other things. This storage solution will provide you with much-needed shelf space without taking up any actual floor space. As such, this storage idea offers probably the biggest bang for the buck. Don’t let the small counter space on the vanity limit your storage area. You can use a stacked dish rack on the counter top of the vanity to offer additional storage space. After you’ve implemented this solution, you won’t be able to complain about a lack of space for your toiletries. You can get yourself some more storage space by using door hooks. There is a wide range of styles, materials, and colors you can choose from so you won’t have to sacrifice style for usefulness. Door hooks are also pretty inexpensive, so you won’t have to break the bank to get some. If you don’t have a medicine cabinet installed in your bathroom, consider getting one. It’ll provide you with more storage space that you can put to good use. You can perhaps buy a used one at a thrift shop or pick up an attractively priced one at a big box store. All in all, there are lots of storage ideas for small bathrooms. 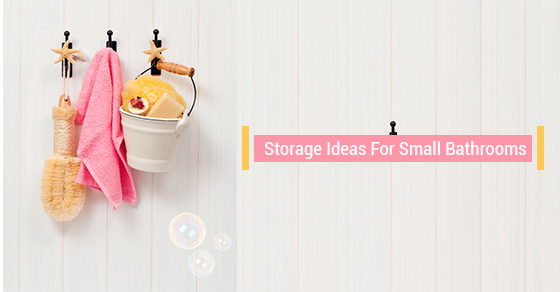 Try a few of them out to make the most of the storage potential of your bathroom.